Let me start with an upfront declaration – you are not about to read “9 Poses Your Hips Need Now” or “The 5 best poses to open up tight hips”. In fact, when my students suggest to me that I need to teach “a whole class on hips”, I am completely perplexed. Because every class I teach is a whole class on hips! Hips are right there in the middle of our bodies; every pose, from Tadasana (Mountain Pose) to Trikonasana (Triangle Pose), is a hip pose. 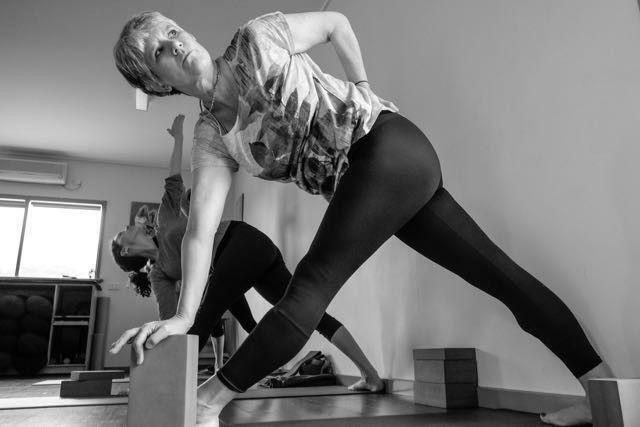 Of course, I understand what people mean when they ask me for a class dedicated to hips – they are thinking of leg stretches, cross legs, Padmasama (Lotus), Supta Padangustasana (reclining big toe pose),Virabhadrasana I (Warrior I) and Virabhadrasana II (Warrior Pose II). Many people believe that they have stiff hips and that their hips restrict them from making progress in their practice. There are important reasons to challenge this idea. One reason many of us feel stiff in our hips is because we spend too much time sitting down. The answer, therefore, is to spend more time standing, walking, swimming or running (if it is safe to do so), moving and of course practicing yoga! From there, we can change our attitude to our practice and make every pose a “hip” pose. For example, when we stand in Tadasana, we have the opportunity to focus on our hips and consciously shift our balance to distribute our weight evenly between the balls of our feet and our toes, between the outside and inside edges of our feet. In doing so, we help align our hips. From that strong base, we then stretch into both sides of our body and extend our spine, neither leaning forward or back. Hence we also align our hips correctly. Thirdly, we must recognise that we risk injuring ourselves if we let our minds dominate the direction of our practice rather than develop a sensitivity and awareness of our body. Our mind is focused on comparisons (is that person better at forward bends than me?) and judgement (I’ve been doing yoga for years and I still can’t put my head on my knee!). This is just the mind doing what it does best. But yoga is about engaging our awareness, focusing on our bodies and exploring the response of our awareness to the postures. We don’t set a goal of more flexible hips and then set about achieving it. We set a goal of doing a regular practice with an open mind, and watch as our body responds and changes as our practice matures. Do you know where your hips are? If we spend time overly focused on hips, there are risks if our practice lacks sesitivity. Hypermobility, or even hip damage, such as osteoarthritis, which can result in surgery. My sense is that many people do not really understand the anatomy of the hips, and this can heighten the risks of hip damage. Some people mistakenly think the hip is the top of their pelvis. In fact, the hip joint is the ball-and-socket synovial joint formed between the os coxa (hip bone) and the femur. A round, cup-shaped structure, known as the acetabulum, forms the socket for the hip joint. The rounded head of the upper leg bone, the femur, forms the ball of the joint. It’s a remarkable part of our body. The two bones move smoothly because of cartilage together with layers of synovial fluid, which also acts as a shock absorber as we move. Our hips allow us to walk, run, and jump and bear most of our body’s weight, and the force of the strong muscles of the hip and leg. It is an impressively flexible joint; only the shoulder allows for more rotation. The cartilage, ligaments and muscles all help to keep the ball and socket in our hips firmly in position. That is one big reason why we need to be deeply aware of our hips in our yoga practice, and not succumb to the temptation to “make them” more flexible. I much prefer the idea of hip stability suggested in this article by Tiffany Cruikshankin the Yoga Journal. To Tiffany’s observations, and the points I have made so far, I would add this: We cannot afford to let our minds rule our yoga practice; we need to be stable in both our hips and in our minds!